Winner Profile: A short biography of the winning brewer, frequently including tips on homebrewing. Back in 1992, while Scott was attending college at Purdue University, he met a man who was home brewing beer. Though this gentleman’s techniques and brewing practices were suspect (he was bottling his beer in clear returnable glass Pepsi bottles and reusing the caps batch after batch) Scott became fascinated by the idea of brewing one’s own beer. Unfortunately, back then he never got past the stage of wondering about it. In 2006, Scott accepted a job as director of a suburban Chicago library district, at which time he met Mike Pezan, the I.T. Manager for the same district. Mike had been a successful home brewer turned pro brewer back in the 1990’s. By asking him a million questions and getting quality answers, Scott was able to avoid many pitfalls encountered by newbie brewers working without a mentor. With Mike’s encouragement, Scott bought a starter kit of equipment and brewed his first batch of beer in June 2008. That first batch of ale was thin and over-hopped, but it was clean and the brewing bug had bitten. Believing that one must practice to become good at anything, Scott began to brew a lot of beer. His favorite styles to this day are the ales originating from Britain and Belgium, though he does regularly brew a couple of German styles as well (kolsch and hefeweizen). Joining the Brewers Of South Suburbia (B.O.S.S.) home brew club was also a huge step in the right direction for Scott’s learning curve. By picking the brains of some of the best home brewers in the Midwest, he was able to learn firsthand from those who had years of experience and knew what they were talking about. Being a librarian, Scott also has read voraciously on the topic of home brewing. His favorite brewing books are: Brewing Classic Styles by Jamil Zainasheff and John Palmer; Brewing Better Beer by Gordon Strong; Yeast by Jamil Zainasheff and Chris White; Brew Like A Monk by Stan Hieronymous; Farmhouse Ales by Phil Markowski; and Home Brewing for Dummies by Marty Nachel. "It is almost immeasurable how much these books helped me advance my brewing skills and the quality of my beers" says Scott. When asked about the key to brewing good beer, Scott gives the same reply every time: "Without practicing good sanitation, starting with a quality recipe, pitching a lot of healthy happy yeast, and having good fermentation temperature control, it is difficult to make great beer." Winning Midwest Home Brewer Of The Year was a goal of Scott’s since 2009. In that year Scott entered his first home brew competition (the Brewer’s Of South Suburbia Chicago Cup Challenge), where his Belgian Dark Strong Ale won a 1st place ribbon. Suffice it to say that at that moment Scott was hooked on competitions! Since then he has won a wall full of ribbons and medals, including a Silver medal in the 2012 GABF Pro-Am competition. As he approaches the five year anniversary of his first brew day, Scott is also approaching his 100th batch of beer. He regularly enters around 10-12 competitions per year and has no plans to stop. Of course, none of this would be possible without the support of his English-born wife and the encouragement of his three children and three step-children. 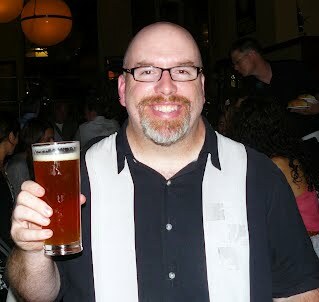 In 2011, Scott finished 7th in the Midwest Home Brewer Of The Year standings. Upon hearing this news, his step-daughter (and craft beer enthusiast) Gabrielle commented: "Next year, don’t let mom hold you back!" Wiser words were never spoken.